Two prestigious ranking agencies have recognized the College of Business MBA programs among the best in the nation. U.S. News & World Report placed the College of Business at No.15 among the top business schools for the International MBA in its 2016 edition of the Best Graduate Schools. FIU tied with UCLA, George Washington University and the University of Texas at Austin, and topped Northwestern University, Michigan State and Yale, among other noted academic institutions. 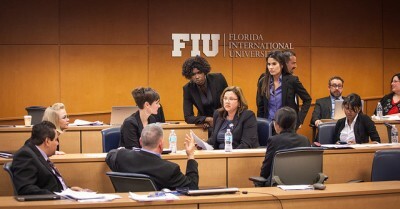 FIU’s 12-month International Business MBA features a multi-disciplinary curriculum in which students take courses in global financial strategy, corporate simulation, international business environment, and functional areas. It integrates seminar-style classes, study abroad opportunities and professional development activities. Rankings are based on factors including peer and recruiter assessment, placement success, mean starting salary and bonus, and employment rates for full-time MBA graduates. The survey was taken in Fall 2014 and early 2015. The College of Business’ Online Corporate MBA program was ranked No. 14 in the Financial Times 2015 edition of the Online MBA Rankings. Among the universities in the Top 15 list are IE Business School of Spain, Indiana University’s Kelly School and University of Florida’s Hough School. This is the second year that the Financial Times has published its Online MBA Ranking. The programs were ranked on a variety of factors, such as “salary today,” “aims achieved,” and “online interaction.” Data for the rankings are collected from participating schools and by alumni who graduated from the programs in 2011. The College of Business has been recognized frequently in the past years for its leading role in the development of new global business leaders. In 2015 it was ranked No. 8 in undergraduate international business programs in U.S. News and World Report’s Best College’s survey. A year earlier, FIU’s College of Business received top honors from Hispanic Business, Financial Times, Modern Healthcare, U.S. News & World Report, AméricaEconomía, CNN Expansión, and Bloomberg Businessweek.